Portable headphone DACs with amplifier are popular nowadays, specially to people who are serious about music and wants to enjoy the best possible sound quality. Music lovers on the go usually listen to their favorite music via their smartphones, MP3 players or notebooks. Unfortunately most of these devices are not built with a decent DAC or Digital to Analog Converter, and they definitely don’t come with amplifier. 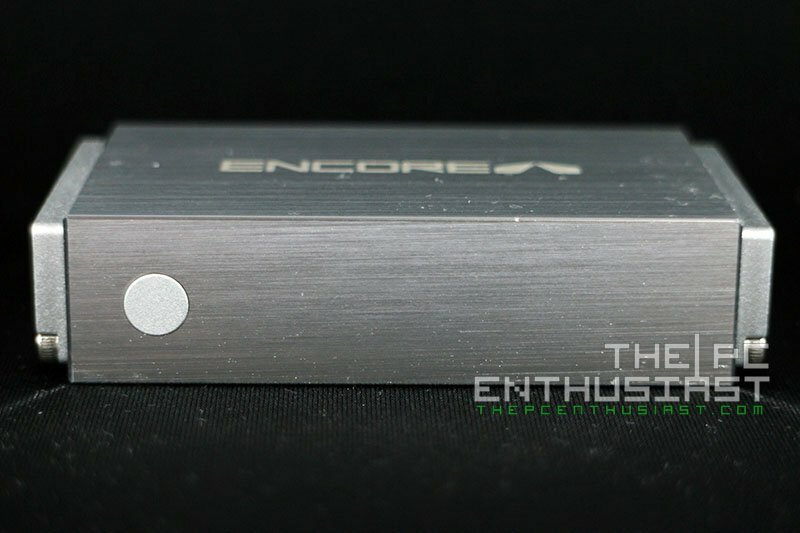 Today we are going to look at a very compact and portable DAC / AMP combo, – the Encore mDAC. The Encore mDAC is a high performance DAC with headphone amplifier that supports up to 24bit/96kHz native sample rate, turning your smartphone, tablet, notebook/laptop or even desktop PC into a HiFi audio player. 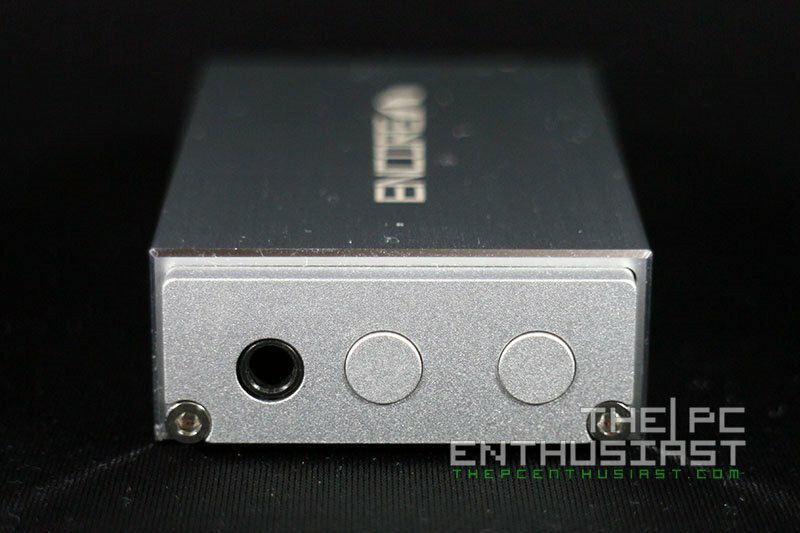 Are you currently looking for a portable DAC/AMP that won’t drain your wallet? Please continue reading my Encore mDAC review below. The Encore mDAC is a small but high-performance DAC with headphone amplifier that natively supports 24bit/96kHz sample rate. It uses asynchronous USB connection and provides double jitter-reduction at data input and over-sampling filter stages. There are no capacitors in the audio signal path and it has a built-in rechargeable lithium-ion battery offering up to 6 hours usage. It also features an advanced DC-to-DC conversion that boosts the analog circuit voltage to improve dynamic performance and overall headroom. It has a digitally controlled analog volume control that provides transparency and precise channel tracking even at low listening levels. The mDAC can be connected to Android smartphones with OTG support, Apple devices (iPhones and iPad) via Apple Lighting to USB Camera Adapter, and most definitely to computers (desktops / laptops) as well. 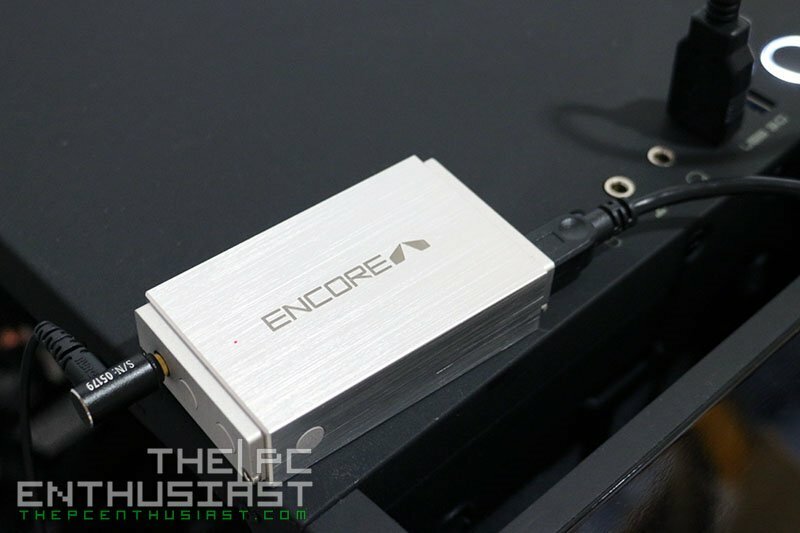 The Encore mDAC is not only for audiophiles / music lovers but also for gamers as well. 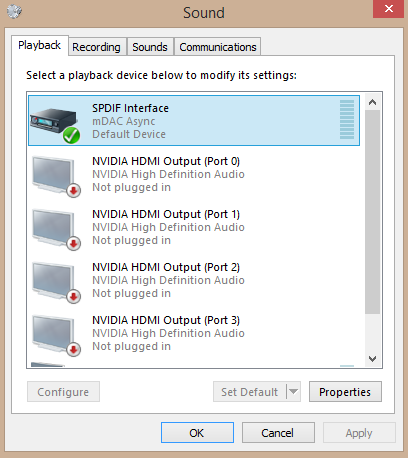 Gamers who don’t have a decent sound card on their PC, or relies on onboard audio will find the mDAC to their liking as well, since it can provide realistic sound effects with detail and clarity. Manufacturer’s remark: Burn-in at least +30 hours in order to optimize the performance. 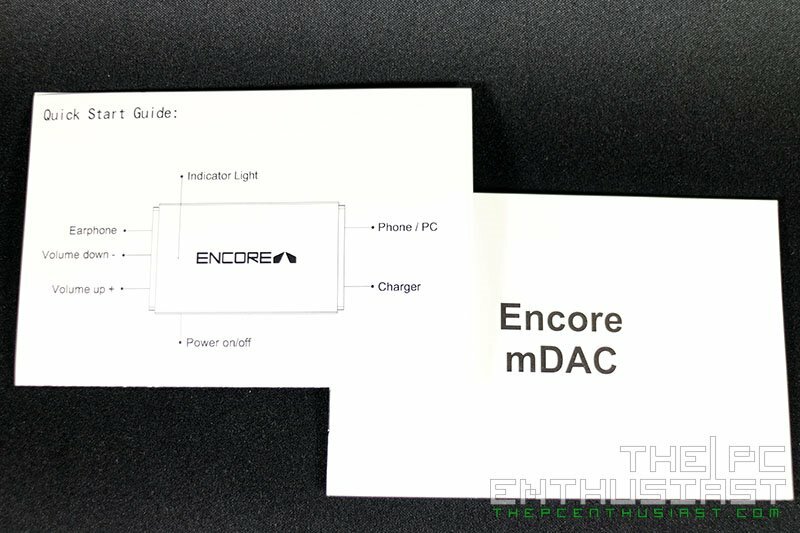 The Encore mDAC comes in a simple small white box. 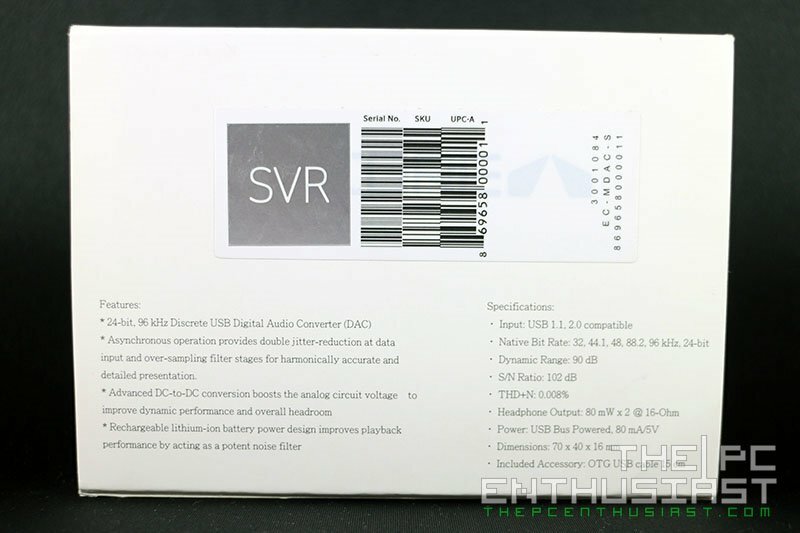 Its features and specifications can be read from the back of the box. The packaging includes the mDAC itself, a short micro USB to micro USB cable, a quick start guide and a manual. The mDAC is available in two colors, Black and Silver. 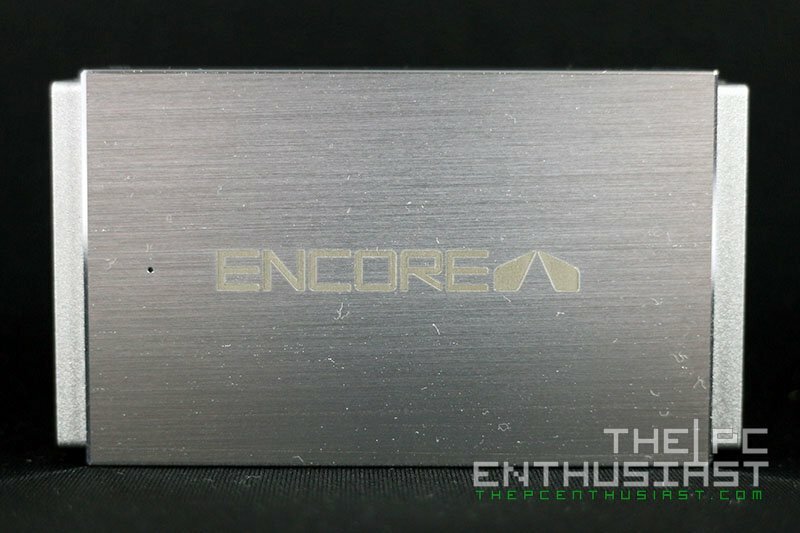 The Encore mDAC features a nice solid aluminum body. 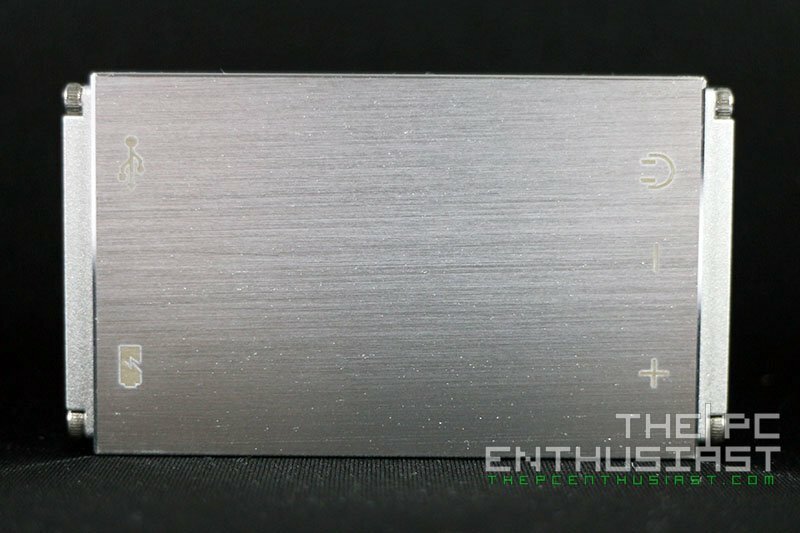 It has thickness of only 16mm, and a length and width of 70mm x 40mm respectively. The power button is located on one of its sides. Press and hold the button for 2-3 seconds to activate the device. In the front side of the Encore mDAC are the 3.5mm output plug and the volume up and down buttons. On the rear side you can see two micro USB ports. One is for recharging the lithium battery and the other one is for the audio input. There are printed symbols located on the bottom portion to indicate what the buttons or plugs are for. Just right next to the Encore logo, on top of the mDAC, is a very tiny hole with light status indicator. It will turn Red when the mDAC is recharging, Blue means the mDAC is turned on but is not connected to any device, and Violet or Purple means it’s turned on and it’s connected to a device. I haven’t opened the mDAC yet since I currently lack the necessary tools to open it. So I don’t have any pictures of what’s inside of the device. Probably I’ll update this review when I get the chance to open it. Meanwhile, let’s put the mDAC to the test and find out how good (or bad) this tiny device is. In testing the Encore mDAC, I’m not sure how many hours I burned it in before I took down notes regarding its performance. But I’m pretty sure that I have used it for more than 30 hours already. Also, in testing the mDAC, I used several of my headphones and IEMs including: German Maestro 435 S, B&W P7, V-Moda XS, Heir Audio 3.Ai s, Ultimate Ears 900s and Audio Technica’s IM02. Most of my collection have low impedance and are very easy to drive. I cannot comment on how it will perform if you pair it with a headphone that has much higher impedance, like the Sennheiser HD 800. I only have two audio sources, one is from my Samsung Galaxy Note 2 and the other is from my laptop. I used the default audio player of the Note 2 for listening MP3 music, and I used Foobar2000 to play lossless files (FLAC) with my laptop. 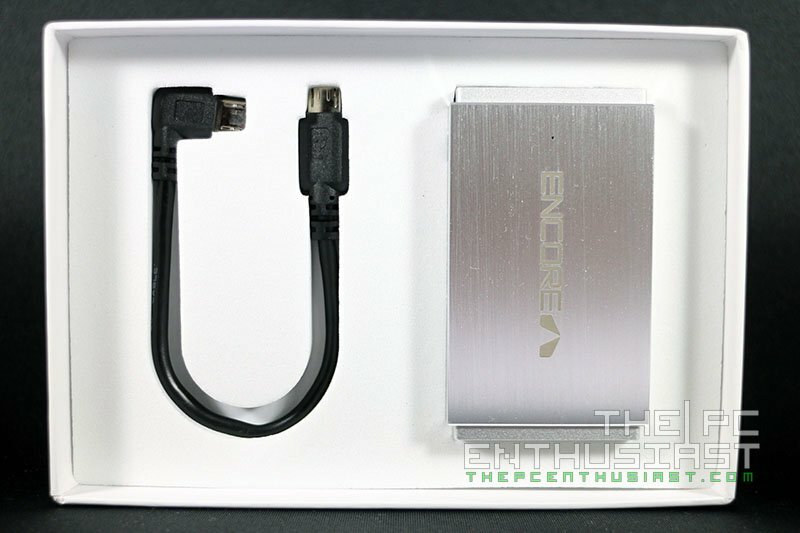 At first I wasn’t expecting much from this device since it is small compared to other portable DAC/AMP and it’s also cheaper compared to its competitors. 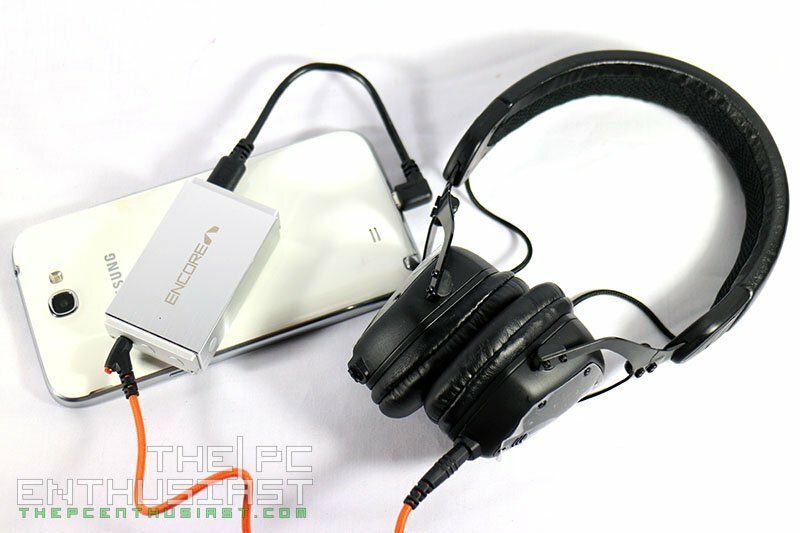 At the time I reviewed the mDAC I don’t have other portable DAC/AMP to compare it with. What I have are DAC/AMPs that require external power, like the JDS Labs Objective2+ODAC combo. First thing that I noticed when I tested the mDAC before playing any music was complete silence. Hiss or any static sounds are obviously not present, as if you didn’t plug the headphone at all. The sound that the Note 2 produced was okay, and I’m sure that the headphone I used has some contributing factors. But listening to the Note 2 via the Encore mDAC was totally different as if the music was more alive. Generally, the sound was warm, energetic and not fatiguing. It’s also noteworthy to mention that the sound became clearer and more detailed. The low or bass level was warmer and punchier, something that the Note 2 alone couldn’t produce by itself. Midrage was more emphasized, making it much more pleasing to listen to vocals. When I listened to classical music like Vivaldi’s Four Seasons or Pachelbel’s Canon, and other live performances, sound staging became wider and you can clearly identify each musical instrument from one another. I also didn’t encounter any problem when I used the Encore mDAC with my laptop and desktop PC. It was very easy to install and you don’t need any additional drivers. However I did use a micro USB to standard USB cable to connect it on my laptop and desktop. Once connected, simply power it on and your computer should automatically detect it. 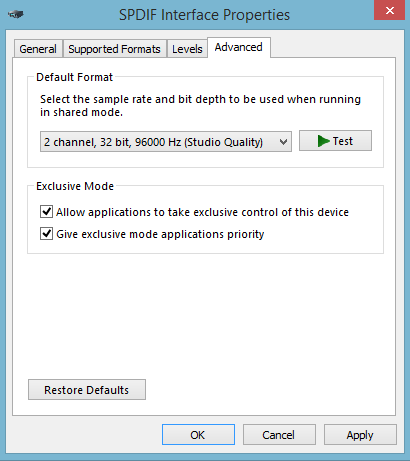 You might need to select it as your default audio playback and be sure to set the sample rate to 24bit/96kHz. It looks like my desktop is incorrectly showing 32bit instead of 24bit. Again, audio quality is noticeably better with the Encore mDAC, compared to my laptop’s onboard DAC. And thanks to its built in headphone amplification, it was able to drive and gave my headphones more energy. As a result bass was fuller and becomes punchier specially when the music requires it. I compared the Encore mDAC with my JDS Labs O2+ODAC Combo and iFi Nano iDSD. Honestly I had a hard time telling difference with their sound quality. All three DAC/AMP didn’t produced any hiss sound, no stuttering, produced a very clean and detailed sound, and over all great sound quality. I guess when it comes to amplification, the JDS Labs and iFi Nano iDSD have the advantage, and the iFi Nano iDSD supports DSD natively and up to 32bit/384kHz sample rate. 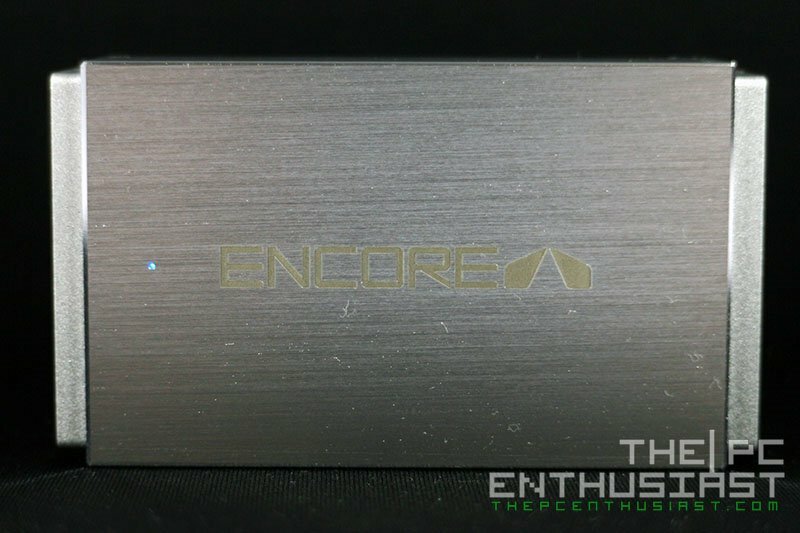 The Encore mDAC portable DAC with headphone amplifier has a manufacturer’s suggested retail price of $129. It’s available in countries such as Hong Kong, Singapore, Vietnam, France, Australia and USA, and probably some other stores that are not listed in Encore’s dealers and distributors. You can purchase it from Heap Audio on Amazon. Honestly, the Encore mDAC surprised me, and I didn’t expect that it would perform (almost) on par with competing DAC/AMP. It’s amazing how a tiny device can deliver this level of audio quality for a much lower price compared to other portable DAC/AMPs. I’m really itching to open this up and look what’s under the hood. I do have some minor complains though, but it’s not really a deal breaker. I’m not a fan of button-type volume control, unless there’s a display. There is no way for you to tell what the current volume level of the mDAC is. Not unless you connect a headphone and listen. The problem is what if the volume was set (too) high and you are totally not aware. You might be in for a shock and it could hurt your ears. What I do is turn down the volume of the source and slowly adjust things from there. Also I think it lacks the necessary cables. The package only includes one micro USB to micro USB cable. I think a micro USB to USB cable, and a 110-220v USB wall charger would also be nice to include in the package. Aside from the great audio quality for its price, I also like its aluminum casing. 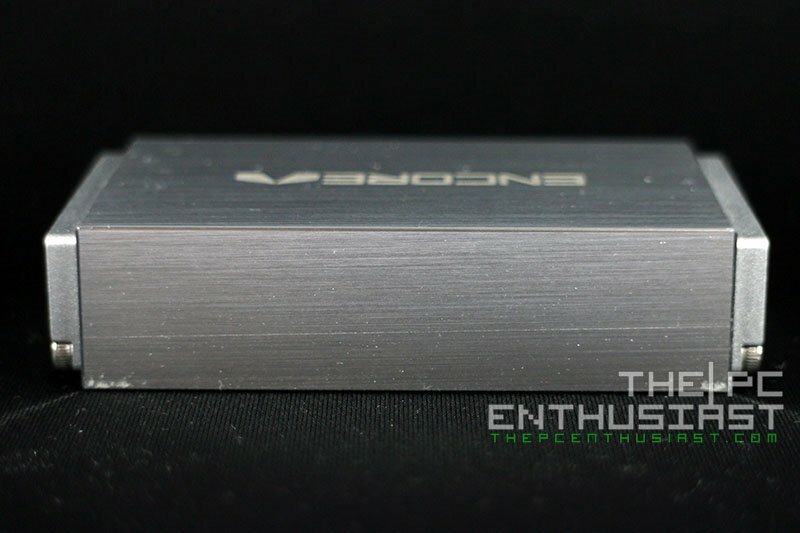 It’s very solid, hard to bend by hand, and it has an aluminum brushed finish. I almost forgot to mention, I did try to play some PC games with the Encore mDAC to verify the company’s claim that it can deliver “realistic sound effects that really put you in the game”. I tried it while playing Middle Earth Shadow of Mordor, Battlefield 4, Final Fantasy XIII and Call of Duty Advanced Warfare. The sound was noticeably better, more immersive and fun than simply relying on the onboard audio. This is good news since you don’t have to buy an expensive dedicated sound card, not unless you are looking for specific features. 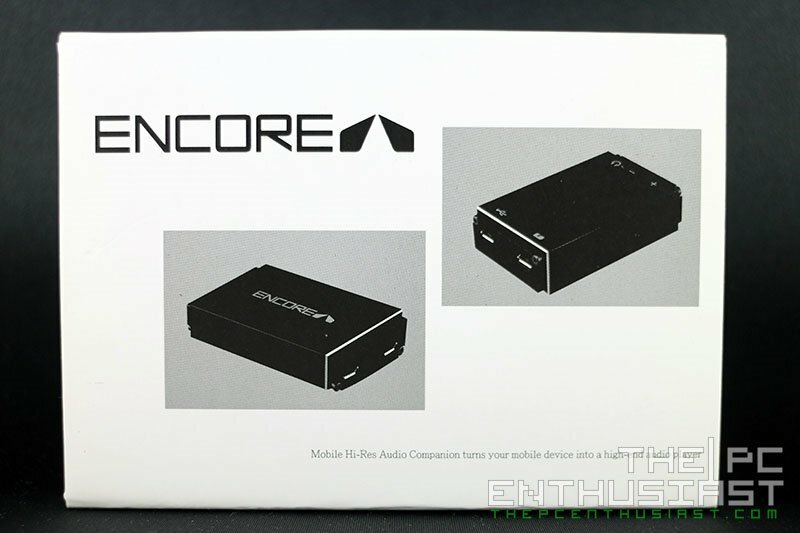 Overall, the Encore mDAC didn’t disappoint me and I can highly recommend this to people who want to experience a better sound quality with higher resolution and detail. 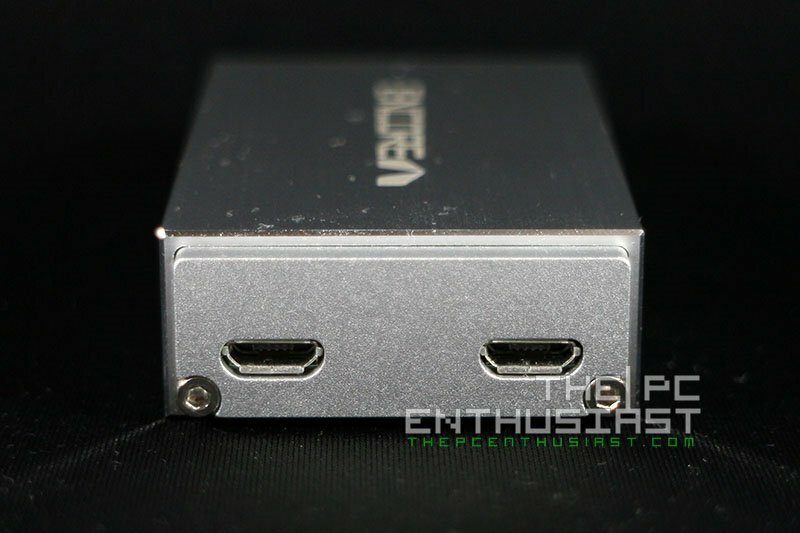 It’s not only a great companion for mobile devices, but it’s also good for your PC as well.